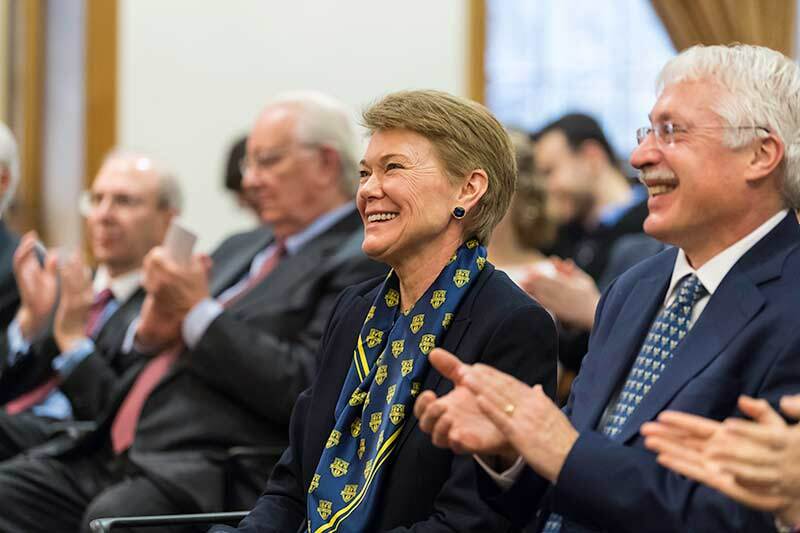 From the beginning, the search for the University’s 11th president was designed to include the voices of as many constituencies as possible—from college students and staff members as well as from top faculty, administrators, and trustees. 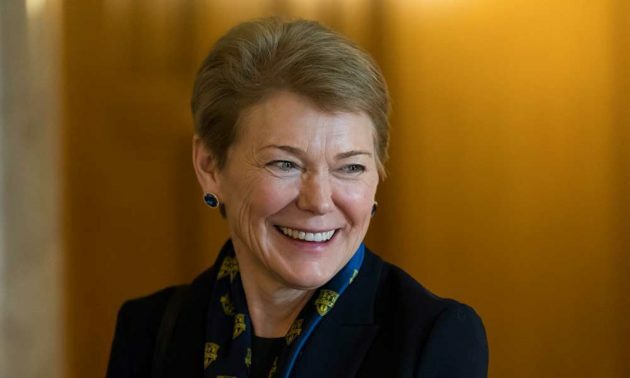 So perhaps it’s not surprising that as University of Wisconsin–Madison provost Sarah Mangelsdorf prepares to take the helm as Rochester’s next president this summer, she enjoys broad and deep support across the institution. Take, for example, Prajita Shrestha ’22, who smiled Monday morning when she opened her Twitter feed to see the announcement of Mangelsdorf’s selection. Read more about President-Designate Mangelsdorf. Among those who played a role in the search process was Sarah Walters, a doctoral student in optics. Walters cochaired the Student Advisory Committee, made up of undergraduate, graduate students, and postdocs across schools and units of the University. She was also a member of the University Advisory Committee that participated with the trustees’ search committee in evaluating prospective candidates. 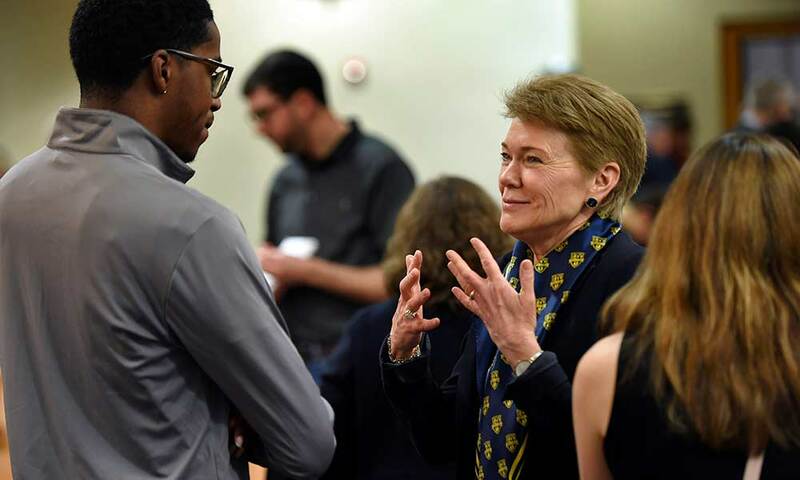 Mangelsdorf, who in her role as provost oversees 12 colleges and schools at Wisconsin as well as several university-wide administrative units, was introduced Monday as Rochester’s next president. She will succeed Richard Feldman, who has led the University since February. 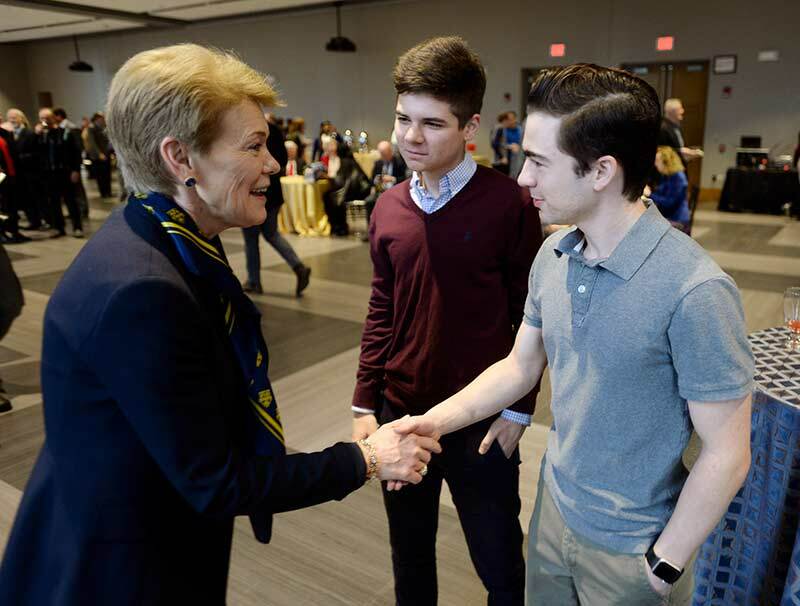 Following a ceremony hosted by University Trustee Cathy Minehan ’68, (who co-chaired the search with Trustee Danny Wegman), Board Chair Richard Handler ’83, and Feldman, Mangelsdorf was the guest of honor during a reception and other activities, where she met with members of the University community. Send a welcome message (and see what others are saying). Jeffrey Tucker, an associate professor of English and a member of the University Advisory Committee, said it became clear during the process that Mangelsdorf was the ideal choice. Tucker says Mangelsdorf’s references—from previous faculty and leadership roles at the University of Illinois and Northwestern, in addition to Wisconsin—were impeccable. Gloria Culver, dean of the School of Arts & Sciences, and Jeffrey Runner, dean of the College, are both confident that will be the case. Runner said Mangelsdorf’s involvement in student life and efforts focused on diversity and inclusion will be important for the University. Read more about the presidential search. Mangelsdorf’s experience at Wisconsin working with a major academic health center makes her particularly suited to leading Rochester, said Mark Taubman, dean of the School of Medicine and Dentistry and chief executive officer of the Medical Center. Mangelsdorf comes to Rochester not only with deep experience as an administrator, but also as a professor of psychology who is a noted scholar of infant and childhood social and emotional development. Melissa Sturge-Apple, dean of graduate studies and associate professor of psychology, has often cited Mangelsdorf’s research and believes her background in family dynamics will serve her well as president. 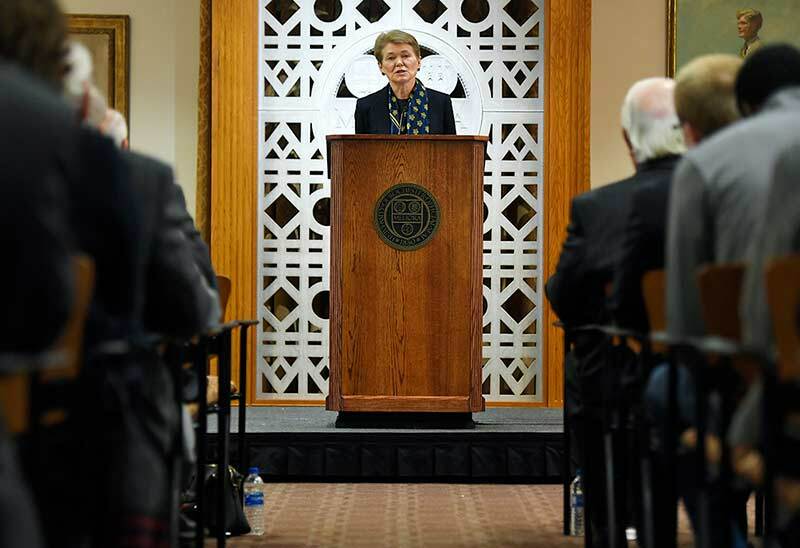 In her introductory remarks, Mangelsdorf highlighted her appreciation for the role that research universities play in the lives of faculty, students, alumni, and staff, as well as in their home communities and in the larger society. Universities are places that change people’s lives, she said, noting that the scientific discoveries, clinical treatments, humanistic scholarship, and performing and visual arts that grow out of academic communities enrich the experiences of people well beyond campus. Jessica Guzman-Rea, director of the Paul J. Burgett Intercultural Center, said she was particularly touched by Mangelsdorf’s comments about the contributions of staff employees. Guzman-Rea said those remarks made her cry. Welcome to Rochester, Sarah Mangelsdorf.